All registrations with the promo code are eligible for FREE RM10 Google Play credits. Check out the Mobile Legends and PUBG livestreams from our ookyokaki gamers Hawkeye, Spartanker, Alan Lembu or Ai Gaming on their Facebook pages. *not real code. For illustration purposes only. Key in the promo code in the Referral Code box in the subscription form on the ookyo website or app. Make sure you do that before you submit your registration, as you will not be able to key it in after successful registration. UPDATE: Subscribers who enter Hawkeye's promo code will have to redeem the reward before 30 April 2019. You have until 31 Jan 2019 to redeem your reward once in the ookyo app upon successful registration. After that, the reward will disappear so claim it as soon as you can! The reward takes up to 3 days upon successful sign up to reflect, so if you don't see the diamond then chillax, it's on its way! Please note that only registrations with the promo codes will receive the RM10 Google Play reward. What's in it for existing ookyo kaki? Don't worry! During this period you are eligible for an upsized 8GB additional mobile internet data with your ookyo plan. Find out more here! 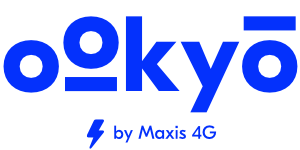 You can also get up to RM125 Google Play credit when you invite your friends to ookyo! More info here!